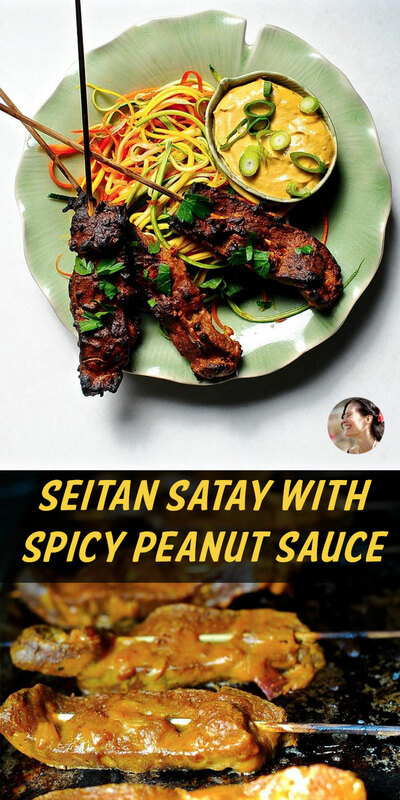 Vegan Seitan Satay with Spicy Peanut Sauce: Make your own delicious Asian take-out at home with these Vegan Seitan Satay! While the satays are grilling make a quick pickled salad and serve on a bed of brown rice. 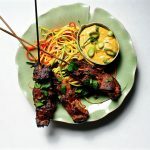 When my hubby tasted these succulent seitan satay for the first time he closed his eyes and muttered ”you captured it, you captured the taste and texture I remember”. Serve them with my delicious easy-peasy peanut sauce (that also doubles as the marinade) and you have an appetizer your guests will rave about. My mother grew up on a chicken farm in Denmark. 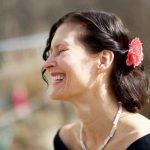 In her 50s she became vegetarian and then vegan and gave up many of the foods she loved like Feta Cheese and her all time favorite take-out: Chicken Satay (which we called chicken-on-a-stick). I suppose we should call this Seitan-on-a-Stick. But I don’t have time to make my own seitan! I’ve got you covered. This recipe works with store bought seitan as well. 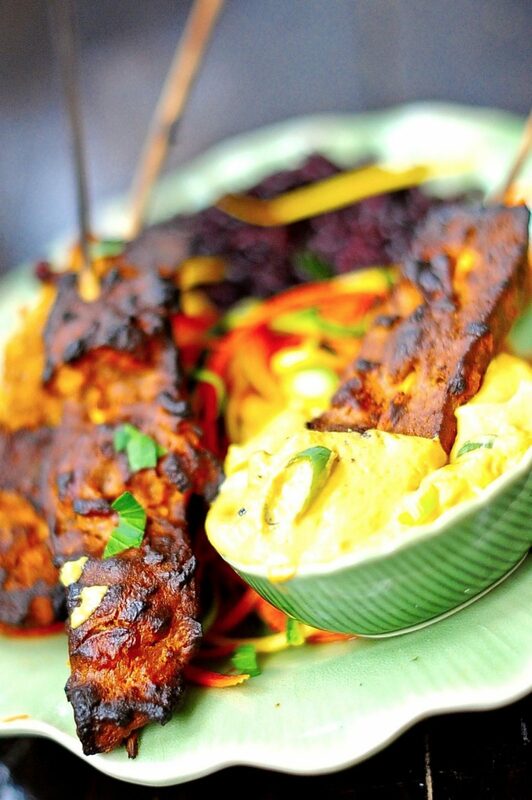 Just skip to the part where you thread the seitan onto skewers, marinate and grill it. If you do make your own seitan then you can make the initial seitan in advance and keep it in the refrigerator until the day you want to serve it. 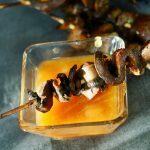 Slice off and marinate only as much as you want to make that day and grill while your guests drink a glass of wine. My seitan Bacon recipe works the same way. Just slice off and fry up the slices you want at any given meal. Summer gathered in the weather, the wind had the proper touch, the breathing of the world was long and warm and slow. You had only to rise, lean from your window, and know that this indeed was the first real time of freedom and living; this was the first morning of summer. 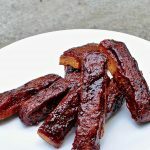 Why should I make my own Seitan? Firstly it is incredibly delicious, much tastier then store bought. You can customize the taste and texture to suit your own palate. Secondly it freezes beautifully so you’ll always have some on hand. Thirdly and perhaps most importantly it is Way cheaper the store bought. Pennies on the dollar I’d say! Don’t I need special ingredients to make my own seitan? Yes and no. You need a bag of Vital Wheat Gluten. I find it at my local Whole Foods, Stop and Shop, Trader Joe’s. It really isn’t a specialty item anymore. Any place that sells brown rice and tofu probably sells wheat gluten as well. Tip : Look for vital wheat gluten in the baking section of supermarkets with the specialty flours or in asian markets. You can also stock up on it through Amazon. It will last for a year in the cupboard. It was the face of spring, it was the face of summer, it was the warmness of clover breath. Pomegranate glowed in her lips, and the noon sky in her eyes. These succulent savory spears (say that 3 times fast) are rich with umami flavors. Serve them on a hot summer night with a cooling shredded salad and soothing brown or black rice and you will have a meal that is perfectly balanced in flavors and textures. You will need wooden skewers for this recipe. I used the brine from my Rainbow Pickles to make the shredded salad you see in the photos. 1/4 cup lemongrass minced use only the tender inside of the stalk. 2 squirts Sriracha, to taste really, you know your own palate. Right? In a blender place chipotles, nut butter, soy sauce, liquid smoke, nutritional yeast, and broth. Blend until smooth. Pour in the liquid from the blender to the dry ingredients and stir until a loose dough forms. It will seem terribly mushy, fear not. Roll up your sleeves and knead the dough with your hands for 3-4minutes to activate the gluten. Form the dough into a ball and press and shape the dough into a rectangle about 8"x"6 and 1 1/2 inches tall. Lightly grease a baking pan and place the rolled out seitan rectangle in it. Bake in the center of the oven for 25 minutes and remove from oven. Place all of the peanut sauce ingredients, except for the shallots, into your blender. Blend until you have a smooth paste. 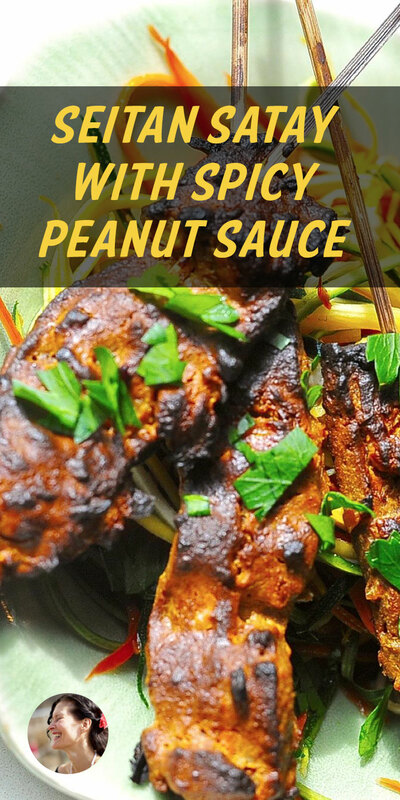 Taste your peanut sauce and make sure it has the right balance for you of salty and sweet. Adjust to your palate but keep in mind the garlic and galangal (or ginger) will keep growing in strength. Now stir in the shallots. 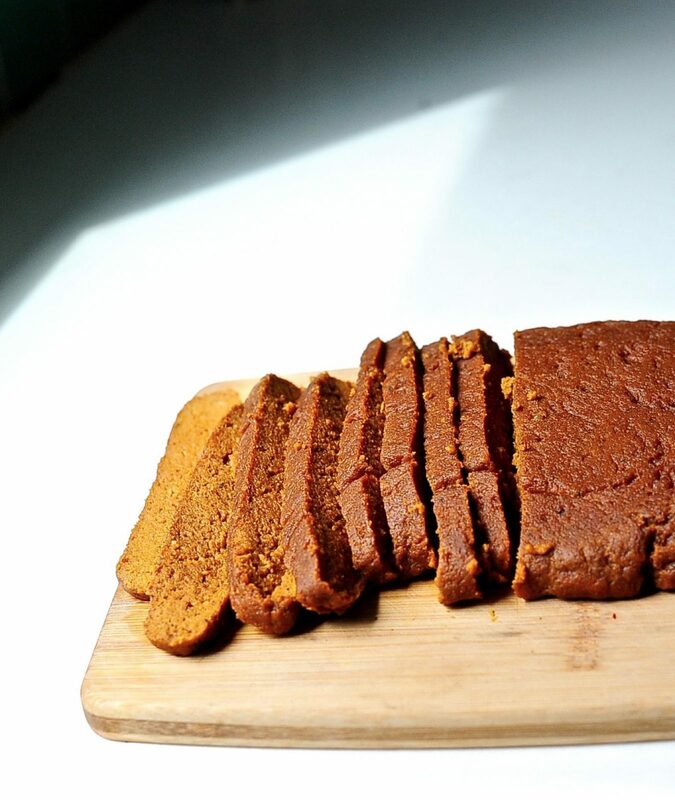 Slice your seitan into thinnish strips. See the photo in the body of the post for reference. Thread the strips onto the wooden skewers. In a shallow bowl, I used a pie pan, place half the peanut sauce and coat the seitan strips with marinade. Honestly I slathered it on with my hands like I do when you apply sunscreen. Time out. You really need to make sunscreen part of your daily routine. Really! Marinate your satay for 45 minutes or you can place the skewered seitan in the fridge covered till tomorrow if you'd like. If I still had a grill pan I would use that, but alas I no longer have one...The broiler works just great though. Turn on your broiler (oven grill) to high. Lightly grease a sheet pan. Place your stay skewers on the pan and if you are broiling (grilling) place a piece of aluminum foil over the exposed ends of the wooden skewers to keep them from charring. Place your pan in the oven broil (grill) about 6 minutes. Keep checking and when you have a lovely deep golden color and a tiny bit of char about the edges then remove form the oven. Katrina thank you! I love eating a rainbow of tastes and textures. 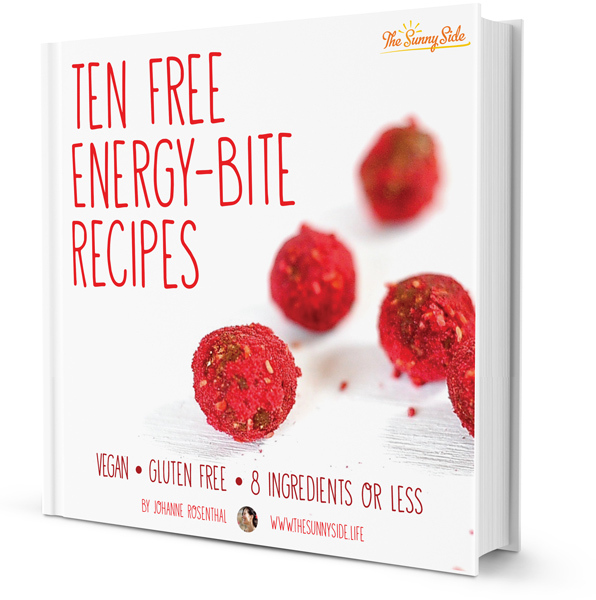 Hanne, thank you for this splendid sunny faery food recipe. I will make this when the lilacs bloom. Time to light the hibachi and smell the lilacs. Great narrative and fantastic recipe, I almost can’t believe this is vegan. Thank you! I peeked at your blog and your photos are sublime. JOJO! You are an inspiration. I have to make this. The writing, the pictures and the recipe what a treasure! Is it cheating to rate the recipe before I make it? Thank you! No it is not cheating to rate them before. I love to see the stars, the more the better, like the 4th of July but quieter. I’m planting up the veggie beds, buying a new habachi and plan to have a summer to remember. Bring your guys over. 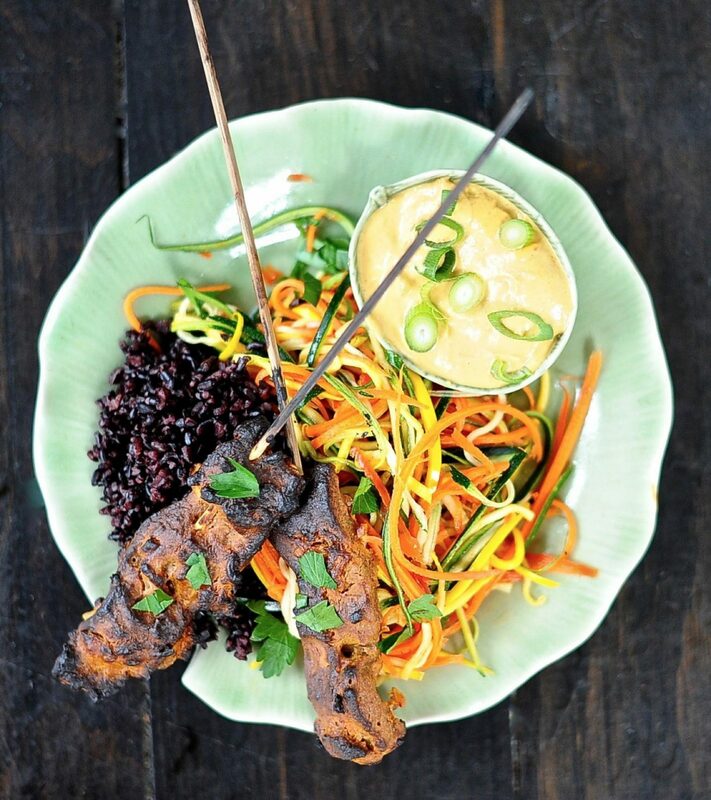 The only thing more fun than saying “Seitan Satay” six times fast, is actually eating this seitan stay skewer. All the delicious flavors like the meat variety, only without heartburn!! Member how Papu used to say Vegan? I wonder how he’d pronounce tempeh and seitan? So I just took these out of the oven… they are marinating for tonight… I’m a little worried tho. I’ve made really delicious seitan in the past but this one seemed very soft and spongy… I kneaded for 5 mins and it’s felt nice and tough. Was yours soft and spongy? Does it firm up once grilled?